Being stuck on a plane can go from feeling inconvenient to existentially horrifying really quickly. Actually, it only takes about 10 minutes. You can imagine, then, what being trapped on a tarmac for five hours does to people, and if you can't imagine, well, it's this. Two passengers on an Aeromexico flight on Thursday from Guadalajara to San Francisco -- which had been rerouted to Oakland due to fog -- became so fed up with the situation that they tried to escape the aircraft via the emergency exit. They were promptly detained. This wasn't a normal case of being stuck traveling. According to the Mercury News, the flight landed at 10:40am, and the crew ran out of food and water by 11am. On top of that, there was no air conditioning, and travelers were passing out. 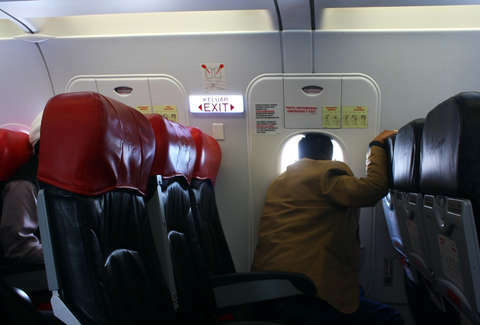 Passengers called both 911 and passengers-rights advocates, saying they were held against their will. “Babies were crying, people were passing out,” a passenger recounted to The Mercury News. Finally, one man threatened to open the door if they weren't allowed off. In response, the pilot called the Alameda County Sheriff’s Office, and once officers arrived, the two men we mentioned above were detained. At 3:30pm, nearly five hours after landing, everyone deplaned, but experienced further delays "going through customs with its staffing depleted from the federal government shutdown," the Mercury News reports. The Oakland airport told USA Today that it's up to the airline whether to let passengers deplane, while Aeromexico told the same publication that because it has no Oakland operations, special authorization was required from airport authorities. Mercury News points out that the incident likely violates the US Passenger Bill of Rights. Four hours is the maximum time allowed on the tarmac before passengers must be allowed to deplane, and violating this can mean a $27,000-per-passenger fine for the airline. There were reportedly over 100 people on board.